OTech: Reach for the top! 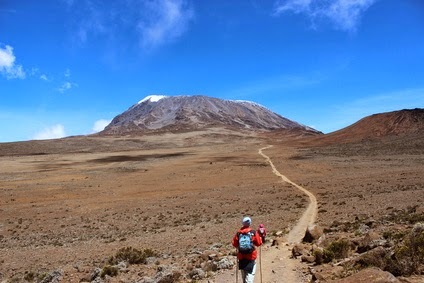 This coming month I’ll be hiking up Mt Kilimanjaro, the highest mountain in Africa (19,341 feet) in an attempt to reach the top accompanied by my Spouse Johanna, and a team of friends and like-minded people to benefit an orphanage in Kenya (see www.carehighway.org). In my case, it is probably more than 50 percent oblivion as it is definitely going to be a big challenge and I might need to switch off my mind occasionally to be able to make it and endure the distance and lack of oxygen. When talking about my trip with friends, family and other acquaintances, the two most common comments are: “why would you do such a thing,” and “I wish I could do this.” Well, the reason I choose do such a thing is that it offers the combination of personal challenge and the opportunity to make a difference by benefiting a good cause. The second comment, “I wish I could do this,” which seems to me always a sign of not being able to visualize one’s opportunities and capabilities. I definitely do not consider myself an athlete, but with proper training and preparation, you can accomplish much more than you think is within your physical limits. I have found that the mental limits are much more challenging than the physical ones. When running races, I have met people who are handicapped, such as the person who passed me in the Dallas half marathon who had two leg prostheses, or who are much older, such as the 73- year-old small lady who passed me in the triathlon, or those who are much younger, such as that 14-year-old kid running past me in my last road race. So, there is no reason for me or anyone to assume that one would not be able to run that race, swim that distance, or hike that mountain. And as for the cost involved, we will be camping out, which I am sure is much less expensive than some people spend on an all-inclusive cruise or vacation on the beach somewhere in the Caribbean. Therefore, I hope that this will be an inspiration for some of those who read this to do the same: Reach for the top, go for the highest, and don’t underestimate yourself, the sky is the limit! I have never heard about the citation you provided here. I have a preferred professional author I can pay to write essay and I'd pick up it for my next paper on English. Thank you for inspiration! People who travel are always the best writers, as they always have what to say and share. I came here because i was in looking for edu birdie but then i saw this picture, which had nothing to do with what i want but damn this site has got it all!! And the picture is so well taken, i cant even ! Trust the airline for their hotel room?